What elegance and what a place for the Queen of Denmark - and this is only one of many castles to the Queens disposal. Incredible this Kingdoms still living in countries like Denmark and Norway. - but of course where to find our new king if not in Denmark where their Price Karl become our first king in modern times as King Haakon 7. The photo is made of a 2 photo stitch. At the end of the Great Northern War King Frederick IV asked architect Johan Cornelius Krieger, royal gardener to the court at Rosenborg Castle, to build him a small pleasure palace on the site of a farmyard named Østrup. 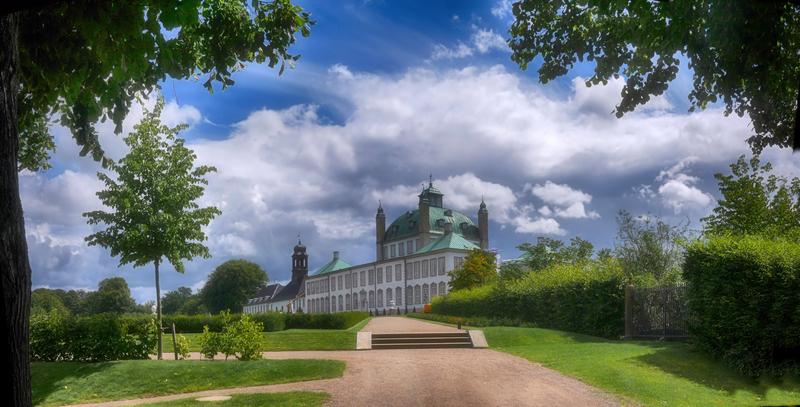 Krieger built the French-inspired baroque palace 1720–1726, and the King himself took an active part in the planning of the building and grounds, and followed construction closely. The man responsible for the actual construction was General Building Master Johan Conrad Ernst, who was also responsible for the construction of Frederiksberg Palace. While the building was still under construction Denmark–Norway and Sweden negotiated a peace treaty, which was signed July 3, 1720 on the site of the unfinished palace The treaty determined the fate of Skåne, which since that time has been a part of Sweden, and ended Denmark’s eleven-year participation in the Great Northern War. To commemorate the signing of the peace accord the palace was named Fredens Borg (lit. "Peace's Castle").